Το βιβλίο προσφέρει συνεχώς εναύσματα για σκέψεις, προβληματισμούς και γόνιμα ερωτήματα. It’s a remarkable book and it takes not only time to read it but even longer to absorb it. It’s certainly a feast for the senses and sometimes so rich for one’s tastes that I had to put it down and digest for a while. The English language, Yannis says, has never thrilled him… It has no music. It does not sing. Well, he writes like one intoxicated with the sound, breath and depth of English syntax. His mastery of our native tongue is astonishing. I suppose being a foreigner, he was determined to learn it but not to beat it into submission. The Russian Nabokov was another virtuoso who wrote like he was conducting an orchestra. Bless my Oxford dictionary. Yannis’ book is a fascinating confession of his life, highly informative and should be made required reading for a student of modern Greek history. He also writes with such love for his country and that communicates itself throughout. Few English writers write like him about their nation. Mostly they write about how ghastly it has become, how class ridden and how culturally stale. George Orwell even parodies it in ‘1984’, and Dickens in the horror of the workhouse. I too had a multitude of jobs going from pillar to post before before language saved me by allowing me to feast on it as an Actor, then eventually as a playwright. I could only sum up his work as Homeric, if that’s not too poncey a description. His is a journey which seems to last a lifetime and one feels it is not yet finished. Sometimes I see overlaps in my life with what I have read in his. I also gained so much reading his constant references to Greek mythology and saw how much it informs Yannis’ life. His knowledge of the ancient and mystic past is formidable and yet he references it with consummate ease as if he drank it with his mother’s milk. I approached this book with both pleasure and trepidation. Having known the author for some years, I was expecting his usual mix of intellect, energy, eccentricity, determination and wit. I wasn’t disappointed. It’s an eclectic blend of the personal, the political, the historical and the visionary, replete with vast knowledge, quirky syntax, and top-notch name-dropping. Some of the personal history Yannis tells in this book was familiar to me, particularly in relation to the path-breaking holistic holiday centre he co-founded and still runs on the Greek island of Skyros. This is a fabulous achievement, requiring vision and persistence in equal measure. Like many other people, my visits there have been life-changing in major and minor ways. I was inspired to write my own book about it, Skyros: island of dreams, also available on Amazon and on the Skyros website. Perhaps the most powerful impression the book made on me, though, was Yannis’ account of growing up in poverty-stricken Athens after the brutal conflict in World War II and after, and the subsequent changes in Greek society and politics, from dictatorship to fragile democracy. It broadened my understanding of the crisis now ravaging that wonderful country, and further fuelled my anger against the injustices that led to it, and that most of our political and business leaders have no desire to challenge. Yannis’ thoughts about survival in our mad, corrupt world gave me a bitter sort of comfort. This is the memoir of a man and his relationship to his culture, his politics and his ideas. It is an erudite and elegant narrative, at times irreverent and provocative and at times romantic and lyrical – always well-informed. It comprises the reflections of someone who has lived observing the world with the detachment of an outsider whilst embracing it still with the passion of a young hot blood. As such, the book provides a rich and colourful read, weaving together personal, political, cultural and historical threads. It arrived on my desk at a timely moment – watching with horror as Greece was further brought to its knees by the economically smug factions of Northern Europe, I had become newly curious about the country. I opened the book intending first to leaf through it and get an overview, but quickly found myself absorbed. I didn’t pause until I was one third of the way through and Yannis Andricopoulos, by now the bemused if not reluctantly successful co-founder of the iconic Skyros Holidays, was meeting Margaret Thatcher and trying to negotiate the titular complications of the English language. For someone writing in a second language, Andricopoulos clearly has a gift – he moves effortlessly between the wry and the poetic. His candid reflections on his own struggles are endearing and he has a disarming almost unintentional way with bathos: “Luck had just deserted me as it deserted even its own temple in Alexandria, the temple of the goddess Tyche, which the Christians turned into a Tavern”. Similarly he describes the way he and his ex-wife Dina Glouberman approached the project of setting up the internationally renowned holistic holiday company as “...the same way we could have booked a holiday in Tenerife”. A book that explores ‘The way we were’ to a protest at ‘The way we are’ and finally a plea for ‘What we could become’. All this threaded around the ‘his-story’ of a vagabond Greek wandering around Europe and reporting on the crucial moments of history since the last World War. For those who like to have their brains tickled every paragraph contains a thought-provoking phrase. I will randomly open pages and give you a taste. ‘Pleasure is not happiness’; ‘Faith, of course, does not take you far’; ‘People joined involuntarily the package tours to disappointment and resentment.’ ‘Truth, objectivity, freedom, duty, worth or merit, all these ‘illusionary’ ideas, went out of fashion just like Jacqueline Kennedy’s signature pillbox hats. Like her multitude of orifices this book has a multitude of these phrases that really requires a long summer to explore but unfortunately it necessitates rapid reading to respond immediately to its warnings for life on this planet. Yannis Andricopoulos’ book History, Politics and Dreams in a Fast-changing World will appeal to anyone whose life paradoxically both swims with and struggles against the larger shaping forces surrounding them, and who constantly imagines something better. A telling, informed and revealing account of a man’s life whose sense of history, myth and politics are the powerful and sometimes toxic mix in which he tries to find a path. Literary references enrich personal insights, political longings grate against the realities of trying to earn a living. The writer offers both a unique personal history of Greece and a powerful sense of history and myth at work in this cradle of civilization. It is also a revealing litany of who the main players have been since the Second World War. This book will also be of interest to students of popular culture, written as it is by one of the creators of Skyros, the unique holiday and learning experience that has been significantly changing lives for over thirty years now, including this reviewer’s. One wonders at the end of the book how Yannis found time for his many other projects and involvements in public life. When I first heard about this book, I thought that the last thing I wanted to do was read some journalist’s view of historical events mixed with his dreams and visions. I was sure it would be a long, sporadic read, struggling to stay focused. 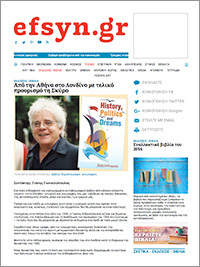 Instead, I quickly was drawn into a very personal, honest account of Greece’s recent political history, and how it influenced and shaped Yannis Andricopoulos’ life and dreams, leading eventually to the establishment of the Skyros Centre, initially a place for personal development and community living reflecting the values and aspirations described in his book. What I found so attractive and compelling about this book was the clear, open, humorous, and reflective presentation of culture, history, politics, and Yannis’s perspective on them and how they shaped and led to the current Greece that struggles today. He embellishes this with references to early Greek history, philosophy, and mythology and several humorous interpretations which keep the book ‘alive’ and interesting. If you start this on a weekend don’t make any other plans because you won’t want to put it down; I had finished it by Sunday evening. Pretty good for a book on history, politics, and dreams! Yannis Andricopoulos has written a fascinating book – interlinking his personal story with Greece’s history over the last 50 years. This is a ‘biography with a difference’ – where the writer moves between the biographical account of his own experience to an account written by the political journalist that he also is, and then also to the reflections written by the historian looking back at those times. In the first half of the book, more of the political journalist gets to talk. This is in part due to the nature of his job as a journalist, as the London correspondent for Avghi and for many years of the famous Eleftherotypia, the Athens daily newspapers. It is also due to his keen sense of history in the making and to serendipity: Yannis met and talked with a lot of the people whose ideas and actions were influential in the history of Greece in the second half of the 20th century. His writing on those times opens an insider’s perspective that is never dull and often surprising. But alongside the political dimension, this book also traces the history of wider cultural developments in recent history. We have come a long way by now from the forties and fifties where the political was of primary importance. Society’s dominant themes first changed to consumption, and then to what kind of existence we wanted to live – both as nations and as individuals. Yannis Andricopoulos’s personal story is in tune with those societal currants, and he traces both the societal and the personal stories in parallel. Together with Dina Glouberman, Yannis Andricopoulos was co-creator of The Skyros Centre, the first holistic holiday centre offering people the chance to combine going on holiday in Greece with the opportunity and the invitation to explore themselves, learn a creative skill and at the same time be part of a living community. An idea that was later imitated by many others. Yannis started this as a venture in Greece, not fully convinced of the concept. However, it was a very successful enterprise and many people kept coming back year after year. The bigger Atsitsa Centre followed, with an wider choice of courses as part of the holiday offering, on the other side of the same glorious Greek island. And following the pulse of the times, more creative courses were added to the Skyros Centre too. Through all the economic doldrums which followed, these centres have kept going, buoyed by returning enthusiastic staff, teachers and participants – in spite of the fear engendered by 9-11, the downturn in Air traffic, the Greek strikes, the recessions etc. Yannis’ dream of changing society for the better has found a way to become realized in the “one person at a time” transformational experience that these centres so powerfully engender in so many who have gone there. Including Yannis. In the end, the political comes to rest in the personal – and the different streams flow together. Ecce homo. Yannis Andricopoulos’ book reminds me of Stefan Zweig’s blockbuster, The World of Yesterday, which is deservedly seen as one of the great books. Yannis has lived as a highly intelligent and multi-talented outsider. His skills as a political journalist make this a vivid, thoughtful and often funny story, written with high awareness of the times he has lived through and constant and refreshing critical appraisal. It deserves to have a readership. This articulate overview spans continents, covers major historical events, and is enriched by the thoughts of great writers and thinkers. Its main fascination for me, however, lies in the personal – in Andricopoulos’s honest, engaging, and flamboyant voice, his particular take on life as a journalist and political commentator over a period of more than fifty years. His account of the origins and growth of the famous Skyros Centre, where I’ve been privileged to teach, offers tangible and ongoing confirmation of his passion for human fulfilment. This is a personal narrative of a rich uncompromised and unconventional life including civil war, deprivation and political repression. The portrait of contemporary Greek history and beyond is seen through the insightful and perceptive views of the author. The disenchantment and disillusionment of what proved to be a political ideological myth was finally followed by the emergence of a new human-based values system. Masterly written reflected account compounded with allegories from history and literature. Yannis Andricopoulos brings his incisive gaze and extensive cultural knowledge to crucial issues of our time. Blending personal memory with philosophy, this erudite memoir is a critique of political and social aspirations as observed from early childhood through the junta years and Greece’s subsequent economic struggles, to the state of the world today. It’s an illuminating analysis that carries its own solution: to make the world we want to live in, by looking more deeply into ourselves in order to revitalise our society. The journey to the Greek past, the author argues, is a journey to the future we need - for our sanity as well as for our safety. His personal journey is an inspiration. I started reading this book and I was riveted by this immensely readable story which goes on a fresh and challenging exploration of historical events and ideas. Yannis is a courageous activist and thinker. His message is strengthened by his personal perspective and style. I am left touched, educated and reflective. Congratulations on a wonderful work. I’ve enjoyed it very much. There were some terrific vivid moments where I felt as if I was there – the long raincoat like a horse blanket; the naked dead bodies; the man dipped in the sea with a bag full of cats, the bullets on the tracks, the awful gun in the mother’s belly, the wealthy uncle holidaying in Rhodes....lots of great description, and these were the parts I liked best. I could really hear the wisdom, too, of a voice from someone who’s travelled far both outwards and inwards, and there were some rich insights, too, which I really liked’. An insightfully and eloquently written personal history that impressively fuses together the politics and history of modern Greece, the impact of life in Athens and London, and the creation of a new dream in Skyros and the Isle of Wight. This intelligent and expressive personal history gives great insight into the roller coaster of post war Greece, the seeds of globalisation in the UK and a new optimism in new ventures in Skyros. I learnt so much from Yannis’ meaningful and moving story of his own journey, his insightful account of the politics and history of modern Greece, and the inspiring creation of The Skyros Centre and Atsitsa. I stopped reading books for many years, preferring instead to listen to the radio, but recently I bought a copy of Yannis Andricopoulos’ book History, Politics and Dreams – excellent title by the way – and started reading again. What a great story, brilliantly presented like paintings in words. One is taken back to the streets of Athens in the post World War II era, to an uncertain political climate with different factions fighting, arguing, debating for the shape of Greece to come. It’s also a book reflecting on Andricopoulos’ life as it unfolded from his student days in Athens and later on across the sixties Europe to his becoming a London-based foreign correspond for an Athens daily newspaper. It’s hard to believe his journey would later on lead him to co-founding Skyros Holidays, something that opened another fascinating chapter in his life. They say there’s a story in all of us. Yannis’ words paint his story in most vivid pictures. When I was a kid (in the USA) one of my favorite TV programs was entitled ‘You are There’ and it brought to life major U.S. historical events such as the signing of the Declaration of Independence. Actors in full costume would represent the major people involved, and none other than Walter Cronkite (who would in later years become America’s most trusted newscaster) was the ‘reporter/commentator’. 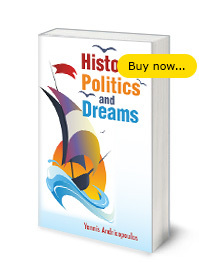 Reading Yannis Andricopoulos’ book, History, Politics and Dreams reminded me so much of that program because with his personal comments, perceptions, and erudite commentary, it is very much as if you are there in 20th century Greek historical and political events. And not just hearing it from an objective reporter, but from one who adds his own interpretation with an often humorous and very personal emotional colour as well. It comes alive as does Yannis in the description of historical events of recent years in Greece and England and their influence on each other and Yannis’ life. He provides glimpses and entertaining stories of how history and politics shaped his own personal journey and his view of how society could be. It is also a journey of personal survival in a world that often lacked caring and resources – he vividly describes his economic struggle led to feelings of despair as a new husband and then father. The author’s deep and far ranging historical and philosophical knowledge of Greece’s Golden Age allows him to bring references from that period’s culture, mythology and philosophy that illuminate the current political and cultural crisis in Greece and in the West with a very sharply focused bright light. Andricopoulos points out that Aristotle said that politics begins with the family. The individual has to be good, because the polis depends on it, but the goodness of all is necessary for the goodness of each. Thus individual goodness was not the task of the individual alone. The polis also had to ensure that a man becomes and remains a good man. In contrast, his experiences with student unions and other groups with high ideals but were consumed by their own selfish or limited views. His view was that in recent times in the West a society emerged where ‘Greed is Good’, and selfishness and superficiality prevailed. ‘Politics, as seemed from its adytum (Go, ahead - I had to look it up too!! - A. Badaines), was based on the most immaculate conception of self interest. The politician did of course, have a view of the world in line with some convictions, commitments to some fundamental articles of faith and well-articulated concepts of the right and the good. But the whole some of their policies was almost always compromised by calculations of self-interest. Quoting Darius, Herodotus made this point beautifully. ‘’Men’’, the Persian king said, ‘’lie when they want to profit from deception and tell the truth for the same reason’’’. In 1989 there was a significant in flow of money from the EU, but rather than leading to wise investment that would benefit (in the case of Skyros Island) the island, the money was used to buy property in Athens. It also led to an increase in corruption and when Yannis spoke out against this on Skyros island, a local took him aside, put his arm around him as if he ‘needed sympathy after a near-death experience following an Al-Qaeda terrorist attack.’ He said to Yannis, ‘It’s all ok.....Don’t worry’. The book in some ways is about history, politics, and the dreams of a better future, socially and culturally based on a new way of relating which became the foundation upon which the now well-known and highly-regarded Skyros Centre was established. It was born out of his struggle to overcome a cynical and uncaring world. He traces its philosophical underpinnings out of his wish and belief that there can be more justice, voice, and equality in society with an emphasis on being and becoming rather than the usual definitions of success. I expected this book to be a difficult read in the sense that I would have to concentrate heavily and move slowly, a bit at a time. Instead, it reads smoothly, is gripping and entertaining and I did not want to put it down - something about the personal with the historical, and the integration of ideas from Greece’s Golden Age that becomes compelling reading. Enjoy!